Grey water is used water from our households like bathroom and/or kitchen sink water, tubs, showers and washing machines. It may contain traces of household elements like food, grease, hair and cleaning products. It will however not contain any feces or water from the toilet, as this is considered Black Water and should not be used at all, as this is a serious health hazard. 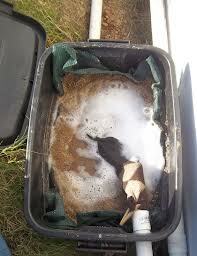 Even though grey water looks dirty, it is safe for irrigation purposes. By no means, is grey water drinkable. Using grey water as a sustainable eco system for your yard, saves money and is a definitive way to live more green. Use a simple low tech system which use gravity rather than pumps, because the larger systems reply on filtration systems and are often designed by engineers, they are more expensive to install and require regular maintenance. There are a few simpler ways to re-use grey water, where no ‘system’ is required. 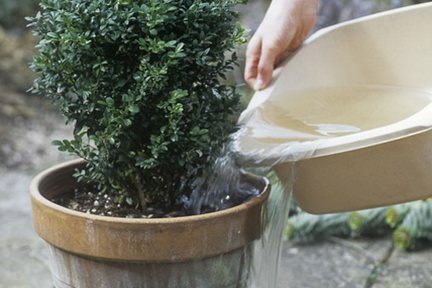 Buckets can be used to gather “clear water” (water used in a shower while waiting for the water to heat up). This water can in turn be used to bucket flush the toilet. Should you not have the type of property where you can utilize gravity to your advantage, i.e. a house on a hill, you will need a drum pump system. This drum pushes the water out through irrigation lines to the plants and desired areas that need water. The average shower uses about 80 liters of water, a bath 120 liter and a washing machine about 100liter per wash. An average household uses about 200 – 300 liter of reusable water on a daily basis. Aside from the obvious benefits of saving water and money, reusing grey water keeps it out of the septic plumbing system and out of rivers and dams. In Cape Town there are already more than 3500 households who utilizes grey water to water their gardens daily. In order to use your grey water and avoid the concerns of potential bacteria cultivating, use the water as soon as possible. By recycling grey water, your total usage of water can be reduced by approximately 50%. If you do not want to invest in a system or you aren’t the homeowner of the property you reside in, you could use the laundry drum system. The water from washing is pumped into a drum (like a barrel or a large surge tank). This water in turn is drained slowly via a hose into the yard to irrigate the garden. It is certainly one of the cheapest grey water systems, aside from the bucket system, but it also has a negative factor to it being you have to manually move the hose around to ensure equal distribution of the grey water. Common grey water problems are that water which is stored becomes an ideal breeding ground for pathogenic bacteria which turns it smelly, slimy and into a health hazard. If the grey water is not treated properly, soon enough, the fat content from the kitchen sink (due to fat from cooking & soaps), smell horrible when distributed over plants in the garden, through your grey water irrigation system and are not good for grass. Should you require advice or more information about this topic, we are available for 24 hour plumbing – simply give us a call!